For years, homes across Australia have been harnessing the power of solar energy through solar photovoltaic (PV) roof panels, and in the process freeing homeowners from costly electricity bills. But technology in this sector is always progressing, and bulky solar panels attached to the roof are no longer the only option – solar roof tiles that combine the look of a traditional tile with the functionality of a solar panel are proving to be a popular alternative for those wanting a more streamlined roof line. Solar roof tiles are mini high-efficiency solar photovoltaic panels made to look like traditional roof tiles or shingles, but with the added capability of being able to convert solar energy into electricity. Due to their thin profile, solar roof tiles can replace or be laid on top of existing tiles to create a sleeker, more integrated roof line than larger, mounted solar panels. Certain materials can be made to produce electricity from sunlight, which is called the ‘photovoltaic effect’. An inverter unit then converts it into alternating current for a home’s electrical circuits, while a battery storage system accumulates excess energy to use at night. When installed, solar roof tiles have a level and integrated appearance, unlike the bulky solar panels that are traditionally mounted on roofs. Solar roof tiles are designed to complement traditional tiles and, although they are still noticeable, they have a sleeker aesthetic. Unlike traditional panelled systems where there is separation between the panel and the roof, there is no such gap with solar tiles. This means debris can’t build up around the system and there is no need to cut, grind or drill through the existing roof during installation. It also minimises the impact of strong winds on the solar tiles. What are the disadvantages of solar roof tiles? Their metallic appearance may not suit everyone’s taste. Solar roof tiles may be less efficient than solar panels due to their thinner composition. While solar panels can be angled for optimum sunlight, the angle of solar tiles follows the profile of the roof. 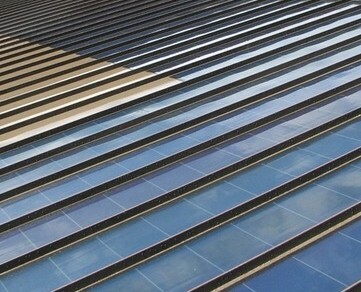 As such, more tiles may be required to achieve the same energy output as the panels. As they’re a fairly new technology, solar tiles can cost significantly more than traditional solar panels. However, rebates and subsidies can help reduce the overheads of buying and installing solar tiles. The first commercial solar roof tiles were introduced in America in 2005. Today, there are a number of companies currently producing and supplying solar roof tiles in Australia. One notable design is the Monier SolarTile – a sleek, modular solar tile that is used in place of conventional tiles. The SolarTiles are made from monocrystalline solar cells and produce about 30W each, in which case 100 tiles are needed for a 3kW solar system. This is sufficient to power a small- to medium-sized home. Depending on where you live in Australia and how much daylight is received, a 3kW system will generate between 10kWh and 15kWh per day. Another impressive style is Tractile Solar – an integrated solar panel that uses layered technology to convert solar energy into electricity and solar-boosted hot water. In 2016 Tesla entered the market with its innovative Solar Roof in a joint venture with SolarCity. Installations are due to begin in Australia in 2018. Solar Roof uses solar and non-solar tiles so that customers can select the exact number of tiles to suit their electricity consumption needs, yet still have a roof in which the solar and non-solar tiles appear seamless. Made with tempered glass, Solar Roof will be available in a range of designs, including smooth, textured, Tuscan and slate.